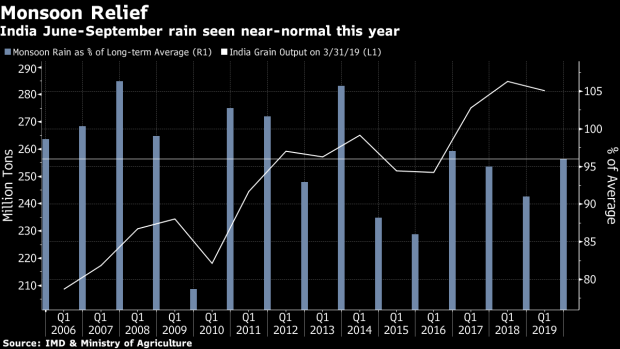 (Bloomberg) -- India’s forecast of plentiful rain during this year’s monsoon may come as a relief to its farmers as well as Prime Minister Narendra Modi, who’s seeking a second term in office in national elections currently underway. Annual rainfall during the June-September rainy season, which waters more than half of the country’s farmland and is crucial for economic growth, is likely to be 96 percent of the long-term average, Madhavan Nair Rajeevan, secretary of the Ministry of Earth Sciences, told reporters. That means the monsoon will help fill reservoirs and irrigate crops, critical for the country’s agriculture. Modi is fighting elections against a backdrop of plunging crop prices and an irate farming community, which his government has sought to placate by raising purchase prices for crops and cash handouts. A good monsoon is critical to India -- the world’s second-biggest producer of rice, wheat and cotton -- as it shapes the livelihood of millions of farmers, influences food prices, and possibly voter sentiment. Still, the monsoon’s benefits aren’t always clear cut. Ironically, a bumper crop aided by good rains in recent years have suppressed prices for farmers as India lacks proper storage facilities, leading to rural distress. Nevertheless, this year’s monsoon prediction may boost overall sentiment and improve the economy’s growth outlook. A drop in food prices helped keep inflation in check and prompted the central bank to deliver back-to-back rate cuts to boost growth in the election year. Consumer food inflation at 0.14 percent for 2018-19 is the lowest since at least since 1991, according to Dharmakirti Joshi, chief economist with Crisil Ltd. The weather office said that overall, the country is expected to have well distributed rainfall during the 2019 monsoon season, which will be beneficial to farmers. Last year’s monsoon rainfall was 91 percent of the long-term average, falling under the IMD’s definition of a below-normal monsoon and missing forecasts for normal rains for a second year. The department will update on the monsoon forecast in the first week of June. The weather department’s estimate compares with a prediction for rainfall to be 93 percent of the long-term average by Skymet Weather Services Pvt., which said this month that the El Nino weather pattern may impact rain. The private forecaster put the chance of below-normal showers at 55 percent and saw a 30 percent possibility of a normal monsoon. While climate models forecast El Nino-like ocean temperatures during May, most models indicate a cooling through winter, which indicates that if it does develop it is likely to be short-lived and weak, according to Australia’s Bureau of Meteorology. India’s meteorological department said weak El Nino conditions were likely to prevail during the monsoon, although its intensity is expected to decline in the later part of the rainy season. “There is no reason to be worried about El Nino,” Rajeevan said. If the El Nino’s weakening trend continues, our next monsoon forecast in June may be higher than 96 percent of the long-term average, he said. “Both these projections are quite early. The more pertinent projection is in May or June when you get something on distribution of the monsoon,” IDFC’s Pan said. The meteorological department is relatively comfortable on the El Nino factor compared to Skymet, he said. The El Nino weather phenomenon, which creates an abnormal warming of the Pacific Ocean, tends to lower rainfall during India’s monsoons. The weak El Nino that formed in January persisted through February and probably will last until June, the U.S. Climate Prediction Center in College Park said last month. --With assistance from Manish Modi.